Way back when! Meghan Markle may be getting ready for the royal wedding, but in a newly resurfaced commercial she was gearing up for a smaller scale celebration — and was looking for the perfect snack. 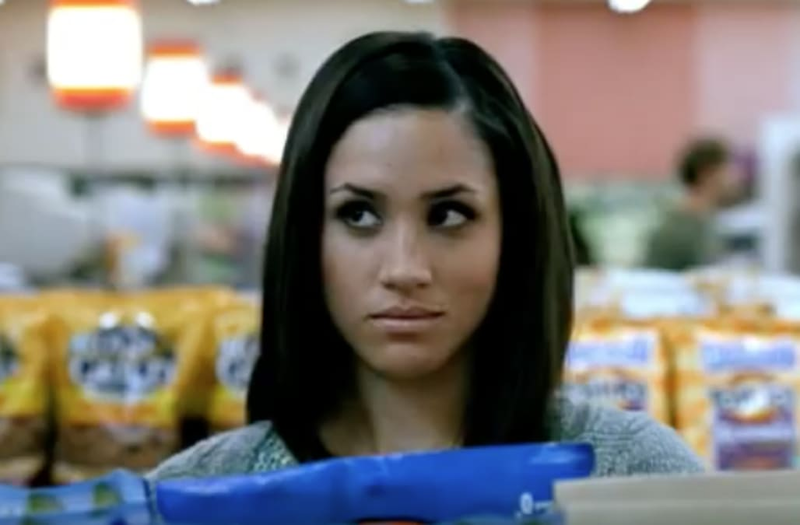 In a 2009 Tostitos ad, Markle, now 36, is on the hunt for a tasty party treat. The former Suits actress can be seen debating which chip bag to buy as she voiceovers her thoughts. “13 ingredients? That’s more people than I invited to the party,” she says. This isn’t Markle’s first acting gig to go viral since getting engaged to Prince Harry in November 2017. Shortly after Clarence House released a statement announcing the couple’s happy news, a video of the bride-to-be from her days as a briefcase model on Deal or No Deal popped up. Markle previously opened up about working odd jobs prior to landing her long-standing role in the USA Network hit Suits. Markle and Prince Harry will tie the knot on May 19 in front of 600 guests at St. George’s Chapel at Windsor Castle in England. They will then host a more intimate reception for 200 at a private reception at Frogmore House.